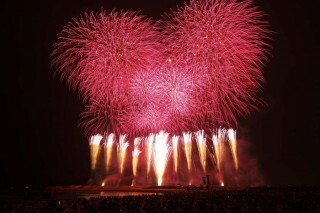 10,000 fireworks will lit the skies over Ginowan Tropical Beach on Saturday at the annual Ryukyu Kaiensai event. 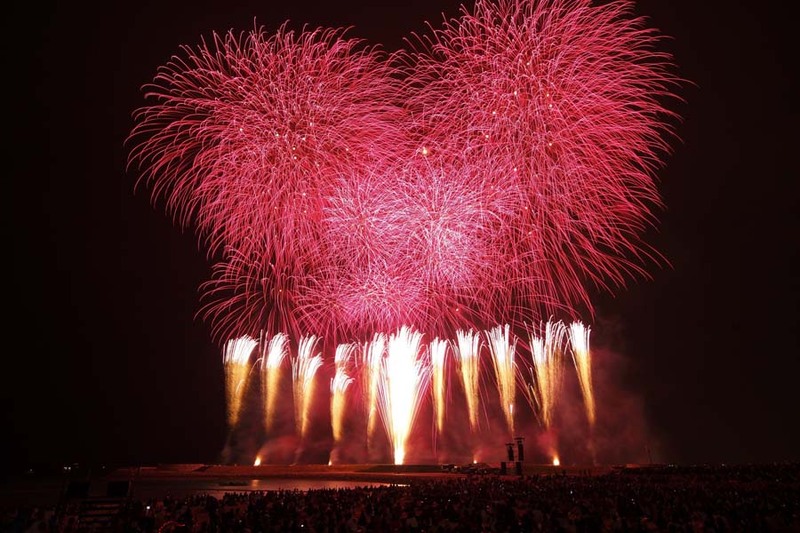 The first fireworks festival of the season is coming up Saturday night, and organizers of the Ryukyu Kaiensai are crossing their fingers the weather prognosticators are correct and they’ll have beautiful skies for the ‘Firework Illusion’. This year’s spectacular marks the Ryukyu Kaiensai’s 10th anniversary, and is a massive collaboration between traditional performing arts “fireworks” which Japan is proud of, “the nature and culture” which Okinawa has, and “music.” Junko Koshino, the global fashion designer designed the spectacular fireworks that will be accompanied by the music of Brazil in honor of 2014 Soccer World Cup Finals to be held in Brazil. The Ryukuyu Kaiensai fireworks will go ahead rain or shine, but the weather forecast so far looks positive. who graduated from the Bunka Fashion College, then moved on to participate in Paris’ collection, holding fashion shows in Beijing, New York, Vietnam and Cuba. Her designs and illusions integrate the latest computer technology with contemporary music. She has also produced the Japan Festival in Washington D.C. The festival goes on ‘rain or shine’, say organizers, who encourage spectators to bring their own cushions to the venue at Tropical Beach, in Ginowan. 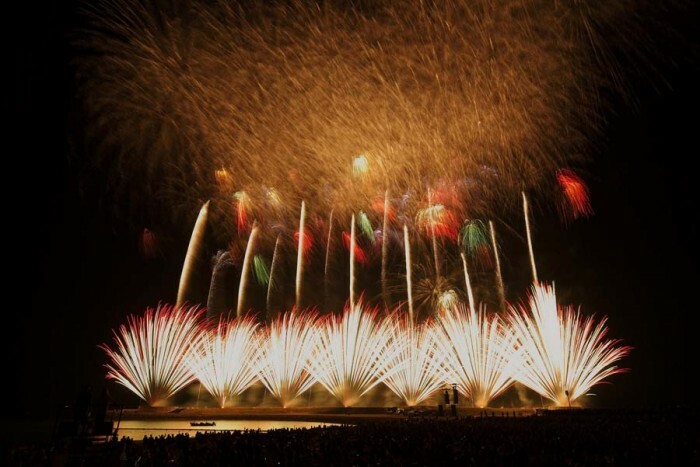 More than 10,000 pyrotechnics of all shapes, sizes, patterns and colors are set to be launched. Gates open at 4:30 p.m. and the music and fireworks program begins at 7:30 p.m.
A 100-person Eisa performance also will excite the audience. A new sponsor is Sanrio Co., the creator of Hello Kitty line of toys and merchandise. Unreserved general admission advance tickets are ¥2,500 for adults, ¥1,500 for elementary and junior high students, and ¥3,500 for adults with a parking ticket included. SA tickets at the gate are ¥6,000 for adults, ¥5,000 for elementary and junior high school students, and \7,000 for adults with parking ticket included. Advance tickets are \500 less than tickets at the gate of the venue.